This is my great-great grandfather Harry Howell Hastings, son of Z.S. 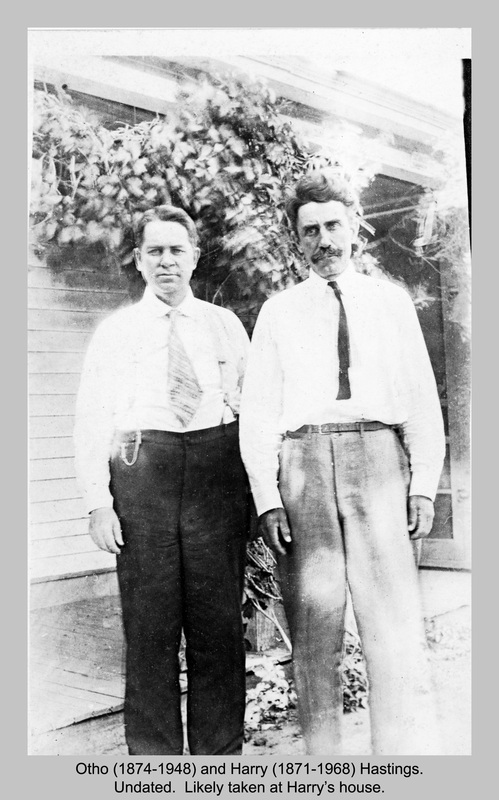 Hastings standing with his brother Otho Ono Hastings. Harry looks so much like Dad and Grandpa in this photo. I love it! So the first thing you’re probably wondering is who are those crazy cats at the top of this page, and what is UP with that beard. Am I right? After spending far-too-long with the Bush’s, I decided I should start tracing the other side of my family a bit. I wanted to know where my last name originated. Afterall, it IS my last name. I had a few generations of Hastings filled into my tree, and started looking for each family member with a good old google search. This is probably not the best way to begin your own genealogical research, however, based on my own findings I wouldn’t discourage it as one course of research. In googling Harry H. Hastings (I believe), I stumbled upon Wikipedia entries for both a Milo Hastings (http://en.wikipedia.org/wiki/Milo_Hastings) and a Paul P. Hasting (http://en.wikipedia.org/wiki/Paul_P._Hastings) . Were they related to the Harry H. Hastings on my tree? Paul P’s Wikipedia page proved unhelpful initially as it listed his father, mother, brother Milo, and grandfather, but not Harry H. Milo’s page, however, contained THE photograph. Not only was it captioned with the names of each member of the family, there was something VERY familiar about that bearded man listed as Milo’s father. From the moment I saw the picture, I knew I’d seen him before in an old photo album that had been handed to my dad years ago. I was certain that these Wikipedia Hastings were in fact family. From left to right the photo is captioned as follows: father Z.S (1838-1925), Otho Ono (1874-1948), Milo Milton (1884-1957), mother Rosetta (Butler) (1844-1934), Edith Elizabeth (1881-1902), Clara Charlotte (1877-1902), Harry Howell (1871-1968). Wiley Warren (1876-1877) and Paul Pardee (1872-1947) are absent. The double initials were fascinating, and… funny. How did my potential great-great grandpa get so lucky as to get three H’s? The Wikipedia entry claims the quote about the double initial names came from the Autobiography of Z. S. Hastings (privately published). WHAT?? ?